From the Suggestion Box: My Favorite Favorite | I'm Gonna Cook That! About a month ago, I asked folks on my Facebook page for suggestions on what kinds of posts they’d like to see here. Nikki (who I’ve known since 7th grade) asked me to make my favorite recipe by my favorite chef. My favorite chef, in case you haven’t been reading this whole time (Why is that, again?) is Julia Child. There are so many reasons for that, but I could take a whole post just talking about all of them and I promised an actual recipe so I’ll just refer you here. My favorite recipe from her? Gosh. That’s a lot more difficult to pinpoint. I had to think about it because it’s so hard to separate the recipes I like watching her cook and the recipes that I actually enjoy cooking. The conclusion I came to was that despite the fact that she might be known for complicated, multi-step French recipes, it’s the really straightforward ones that I think epitomize her style the most. She was humble before the food, and very good at letting it be what it is without a lot of fussing. 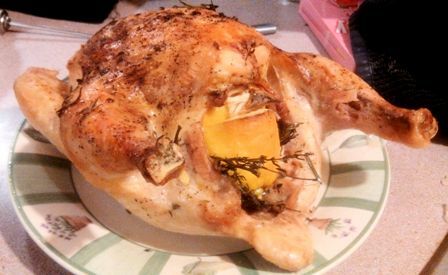 So, I chose this recipe for Herb, Lemon, and Garlic Roast Chicken. It’s one you can easily duplicate at home without having to hunt down special ingredients or equipment. I made one replacement, and I didn’t follow the steps exactly because I just didn’t have the room to spread out like she did, so I’ll walk you through how I did it. Get your mis en place ready first, so the rest of the process goes fast. Grab your herbs and the garlic. 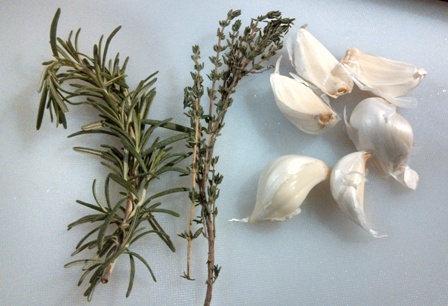 Smash the garlic cloves, then chop one of them, plus half of a sprig’s worth of rosemary leaves and one sprig’s worth of thyme leaves. Add them to the bowl with your lemon juice, plus the salt and pepper. I actually removed the lemon pieces before the next step with the chicken. 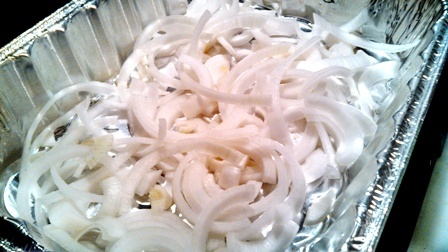 Slice up your onions and put them in the bottom of your roasting pan. 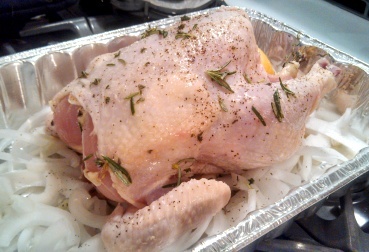 Put the whole chicken into your mixing bowl and coat it well all over the outside with your lemon juice/herb mixture. 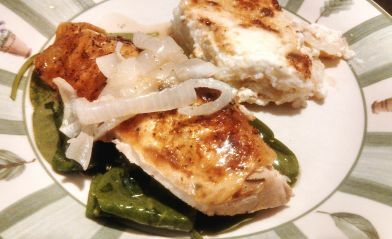 Season the inside of the chicken really well with salt and pepper, then place it in the pan on top of the onions. Pour whatever lemon juice is left over the chicken, drizzle it with the olive oil, and sprinkle the whole thing with salt. Stuff the lemon halves, the remaining whole sprigs of herbs, and the smashed garlic cloves inside. I think it’s more important that you get all the herbs and garlic in there, so if you don’t have room for all the lemon halves, try to get as much in there as you can. I stopped at three. Wash out the bowl because you’ll use it again when the chicken comes out of the oven. I did not have twine (bad preparation on my part) so I wasn’t able to tie the legs together, as the recipe says. I should have, and normally I do because it just makes for a prettier chicken. Plus, it seems to cook more evenly when I do that. However, this time we went with the less dignified version. Poor chicken, here she is, legs akimbo, stuffed to the… whatever. So humiliating. Sorry, chicken! Pop the chicken into the oven for about an hour and 15 minutes. If you’re nervous about chicken cooking temps at all, use a meat thermometer before you pull it out of the oven to check. Measure at the thickest part of the meat in at least two places, without touching any bone. You want a minimum internal temperature of 165°. Feel free to sit down and have a glass of wine or something while the chicken roasts, because you really can’t do the next step until it’s out of the oven. No, really, put your feet up! Watch that episode of Supernatural you’ve been saving on the DVR and let that chicken do what it’s doing. When your chicken is all done roasting, pull it out of the oven and move it to a plate with your tongs (or whatever’s handy). Poor chicken. It’s even more humiliating from this angle. Cover her loosely with some foil while she rests and let her have a moment to herself. Strain the hot liquid from the bottom of the roasting pan into a bowl. The chicken stock listed in the ingredients should be used to deglaze your roasting pan/baking dish. Since I used one of those throw away aluminum jobs, I didn’t really do that step. However, if you’re using a real pan that you can put over heat and properly deglaze, that’s what the stock is for. Pour your deglazing liquid into the bowl as well, and then whisk in the walnut/hazelnut/olive oil (Whatever you have is fine. I used walnut.). What you’re basically doing here is making a pan sauce masquerading as a vinaigrette. 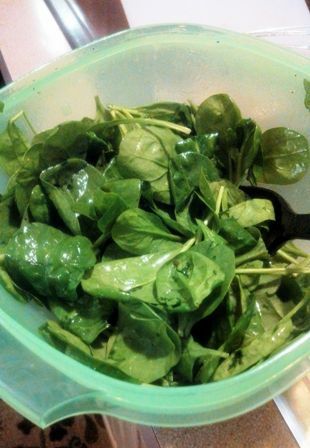 Toss whatever greens you’re using in the vinaigrette. They’ll wilt slightly, or maybe more than slightly, depending on how hot the liquid still is and how much you toss it around. Adjust the seasoning as you see fit and give it all another little toss. Annnnnd… you’re pretty much done! Plate it up and call everyone to the table. Time to grub! I hope you’ll try this one, because it’s really delicious and, as Julia’s recipes go, pretty flipping easy to get together. The lemon adds some nice brightness, and using the pan juices to make that vinaigrette brings a little something special to what would normally be just a plain roasted chicken recipe. Pingback: Just Truss(t) Me | I'm Gonna Cook that! This recipe reminds me of Gordon Ramsay’s roast chicken where he stuffs it with pan seared chorizo sausages, diced onions, thyme, rosemary, borlotti beans, roasted red capsicum and half a lemon. I remember it did look a little humiliating for the poor chook but the stuffing was extremely delicious let alone the chicken. I’ll have to check out that Ramsay recipe. It sounds delicious! Just found a video of it. ps:both my older sister are jensen ackles freaky fans too!!! That chicken looks delicious. Just Yesterday my Sicilian friend here in Trapani brought me about two kgs. 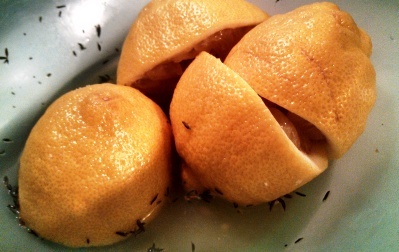 of lemons from her garden, I was wondering what to do with them. You gave me a great idea. 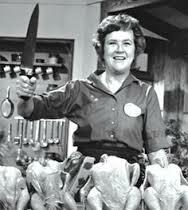 Julia Child looks so threatining:) Who is Jensen? 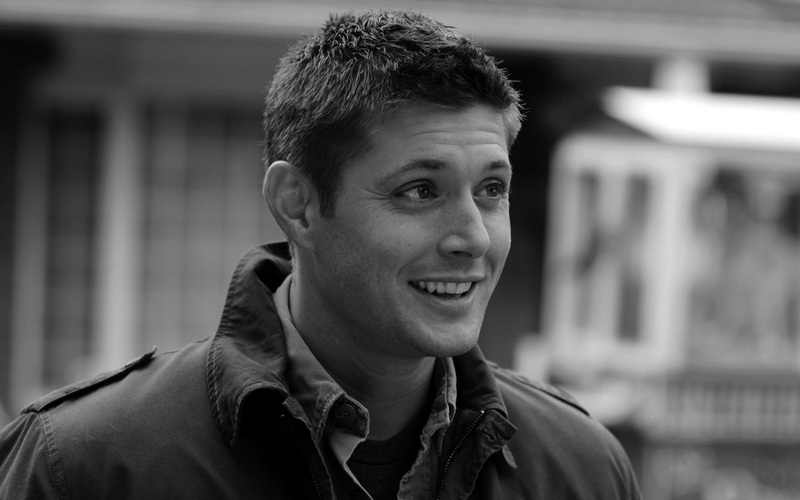 Jensen is an actor on an American TV show called Supernatural. I don’t even usually watch television, but this show sucked me in! I’m kind of jealous of your abundance of fresh garden lemons! I JUST had lunch, and I’m getting hungry for this right now. This looks SO good! thanks! if you end up making it, let me know! So honored you used my suggestion!! And…I’m gonna cook this!! Yay! Let me know how it turns out.